I’m having some problems with fields likes Radio Button, DropDown, they always select the first choice, but that is wrong. Need to have something first, like “SELECT” then they can select. When we create a new entry in the Corrective Action form the drop down fields width are not set properly. The field is too narrow only showing the first few characters. I attached an image of the issue. I’ve been working with Microsoft Access for several years and I’m used to use it’s standards. It’s very difficult for me to understand MyTaksHelper’s philosophy as to database basics, eg. tables, indexes, references, SQL-queries, views, etc. I would also like to know whether it is possible to create 1:many forms in MyTaksHelper. For example I have one record in Tasks table and it has several “subrecords” (subtasks) stored in (sub)table called Subtasks. There a 1:many relation between Persons and Tasks. Is there a complete manual (brochure) about how to use MTH? 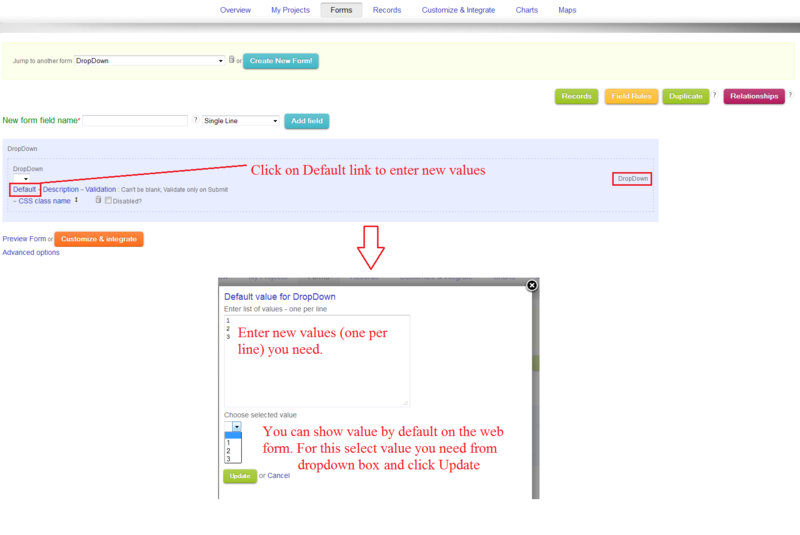 In order to change the number of records per page go to Records page and find Show per page DropDown. Please, see screenshot below. I hope it can also help. • Have a form on the website that has several dropdown boxes, the content in each box comes from the fields in my database. Dependent on the selection of the 1st drop down box i.e.cuisine, only the locations which have a bar or restaurant with that particular type of cuisine will be available to be picked in the ‘location’ drop down box. I thought this would be a validation type, so that I first create one drop down box, then create a second box in the same form, and I use a validation rule that tells us that it only shows certain field data dependent on what was selected in the previous drop down list. This way, the search will basically narrow itself down, so that the visitor could select precisely what he is looking for. Would you check out what appears to be an annoying bug in DROP DOWN FIELD when editing a record. It appears that when a drop down field is set to use a space as the default first option (a method I use consistently) that when editing a record MTH does not appear to read the data for the drop down but uses the default option. To be clear; when editing a record it appears that where a field is a drop down that MTH does not read and display the data stored but instead displays the default for the drop down field type. This is an inconsistent bug that I can not find a process to make happen every time. Bug in Search parameter Dropdown. It appears that is a Drop Down field is disabled, even though a default is set and validation is mandatory that the entire contents of the drop down selection list is written to the database record field. Works fine if field is not disabled. The new advanced multiple select dropdown option is not working for new forms. The sample you created and the first form I created work fine, but anything new is loading all the selections to a single cell. When I’m opening Search form and selecting Drop Down field it doesn’t work properly. Most probably this is because I have selected drop down value by default not first, but second item. I.e. I have values: 1,2,3,4,5. And by default on the form and in the search box it shows 3 selected. However, it shows text ‘Search ColumnName like 1’, but I didn’t selected 1. So MTH by default searches for first drop down item, not selected currently in the form. When a User enters multiple search criteria, then saves that criteria to use again later, the resulting name of it usually does not display fully in the “Current Widget” drop-down field, and, sometimes, the User will not be able to distinguish one from another, e.g., “LCMS Church = St. Johns and Baptism Readiness = A” and “LCMS Church = St. Johns and Baptism Readiness = C” appears the same in this drop-down field, since it is cutoff. When a User searches on a drop-down field, it uses “Like”, instead of “=”, e.g., with my Project’s “Baptism Readiness” field, with drop-down values (UNKNOWN, A, B, C, Already Baptized), when I search on “A”, it not only returns Records with “A”, it also returns Records with “Already Baptized”. I only want the former, not the latter, to be returned. Please use “=”, instead of “like”, or, provide these as alternatives. For a Drop-down Field (e.g., “Baptism Readiness” that has possible values of “A”, “B”, “C”, “UNKNOWN”, and “Already Baptized”), when using it in search criteria, ONLY ONE value may be used (e.g., if I search on “Baptism Readiness = A”, I cannot also search on it for “B” or “C”) – I don’t want to perform 3 searches (A/B/C). On the Records view, the “Page No.” drop-down shows the correct no., but, since the system allows the User to change it, there’s an assumption that changing to another page no. will navigatge the User to that page – it doesn’t (it just stays on the same page). It would be very handy to be able to show more than one column in a drop down box. Perhaps two or three columns as an option would be nice. I am wondering if it is possible to make a form with a multiple select dropdown that will record each of the selections as an individual entry? For instance, a multi-select dropdown containing student names that creates a separate data row for each student selected. Thank you. Field with the some name!! first a drop box with a diferent name, ok and ko and after a field sing line comments.